Describe the history and development of SBS-modified bitumen roofing systems, including their anatomy, material properties and building code considerations, such as fire- and wind-resistance. Explain modified bitumen sheet anatomy, incorporating discussion of heat-weldable, self-adhesive and cold-adhesive-applied sheets. Discuss roof system applications, including pertinence to environmental and safety impact. Describe modified bitumen membrane surfacing, including highly reflective surfacing material options and their impact on building performance. We sometimes hear people state that they are thankful simply to have a “roof over their head,” and with good reason. Roofs serve the fundamental job of protecting us from the elements, and they are often taken for granted until a leak or other structural deficiency manifests. As building professionals, it is our job to understand not only how to construct and repair roofs, but to know enough about the roofing membrane material and application methods available to us to ensure we are installing long-term protective solutions that will last in a given environment. What you need to know about SBS-modified bitumen roofing. While there are a number of roofing membrane technologies available on the market today, not all are created equal, nor are they created to necessarily excel in the same applications. If we attempt to categorize the membrane systems available, the simplest way to do so would be to bucket them into “single- ply” and “multi-ply” technologies. Single-ply roofing typically consists of a synthetic sheet material that is factory-manufactured and is most often comprised of polyvinyl chloride (PVC), thermoplastic polyolefin (TPO) or ethylene propylene diene monomer (EPDM) polymer formulations. 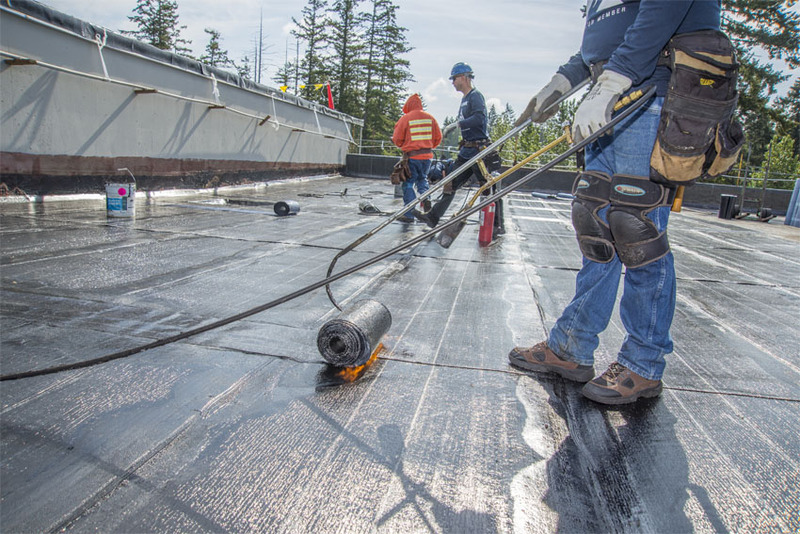 Multi-ply, or “built-up” roofing systems are comprised of various protective layers, and generally rely on some form of asphalt to provide waterproofing performance. This content will focus primarily on multi-ply roofing systems, and will examine the nuances of styrene-butadiene-styrene (SBS)-modified bitumen systems in particular. Advantages of multi-ply roof membrane constructions. The history of SBS-modified bitumen membrane usage. Recent developments in SBS-modified bitumen materials. Let’s start with a fairly basic question: why would we choose multi-ply roof membranes over single-ply options? The answer: they all provide protection through redundancy. Redundancy is the duplication of critical components or functions with the intention of increasing reliability of the system, usually in the form of a backup or fail-safe mechanism. Bullet-proof vests have multiple layers of Kevlar, hospitals have backup generators and equipment, tires have multiple plies to prevent punctures, and the space shuttle has hundreds of examples of redundancy from heat panels to the internal systems. These items are integral to the protection of people and equipment, and they’re more effective because of redundancy. What do all four of these items have in common? They provide safety and protection through redundancy, much like a multi-ply roofing system. The chief responsibility of a roofing membrane system is to protect the building and everything in it from water intrusion. As is the case in the examples above, redundancy keeps the people and valuable items inside a building dry. A single-ply roofing system is not always adequate to withstand all the elements and conditions that are sure to attack the roof membrane, whereas a multi-ply system is better equipped to handle all conditions. Unlike relatively “disposable” mobile phones and computers, roof membranes must endure all that man and Mother Nature can dish out, and they must perform for decades, not merely a few years. This article will chiefly cover SBS-modified bitumen and multi-ply roofing systems. SBS-modified bitumen refers to the specific composition of the roofing membrane. These membrane materials are often combined with additional layers of SBS-modified bitumen, PMMA liquid-applied membrane, PVC synthetic single-ply membrane or other materials to provide buildings with layers of robust protection against the elements. Before we get into the technical aspects of these systems, it’s important to understand the basic history of modern roofing systems to fully grasp what materials we have at our disposal today, and how that came to be the case. In the U.S., about two-thirds of the market is made up of single-ply membranes comprised of materials such as TPO, EPDM, PVC, plus a few others. Why is this the case, if we started out by saying that multi-ply roofing systems offer better protection? There are a few reasons. The growth in singleply membranes over the years has been primarily price-driven. Also, single-ply membranes have fewer barriers to entry for contractors because there is less equipment required than other systems and it’s thought to be easier to install. 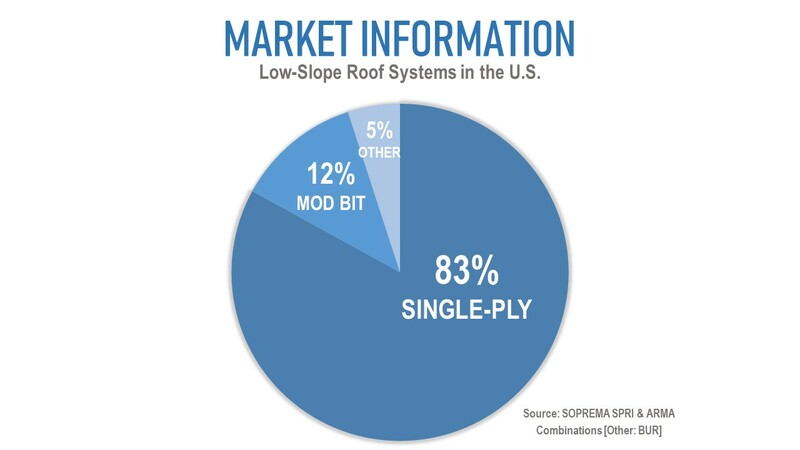 According to the 2014–2015 NRCA Market Survey, SBS-modified bitumen makes up approximately 23 percent of the low slope roofing market in the U.S., and the “other” materials making up the last 11 percent of the market include foam and metal. Outside the U.S., however, multi-ply systems are far more common. In Canada, low-slope roofs are primarily covered with SBS-modified bitumen membranes. Part of the reason is SBS-modified bitumen systems’ ability to stand up to the continental climate of Canada that leads to winter temperatures between 5 and -40 degrees Fahrenheit (-20 and -40 degrees Celsius). In much of Europe, the market is also dominated by SBS-modified bitumen. Modified bitumen membranes originated in Europe in the late 1960s, with many countries developing their own formulations and applications, leading to a strong modified bitumen market built on a track record of proven success. Single-ply low-slope roof systems are by far the most prominent in the U.S. market today, but that was not always the case.